My go-to green smoothie (read: the only green smoothie I've ever liked) is truly delicious, but sometimes I end up putting a little too much vanilla yogurt and peanut butter in it that it seems to be a little fattening. Over the weekend I decided to branch out and try another green smoothie , sans peanut butter and yogurt. Surprisingly, I loved it! It tastes so fresh with all of the different fruits in it, and I especially love the pineapple and frozen grapes. Caleb even thought it tasted good, as long as he didn't have to look at it while he tasted it:) If you're looking for a quick, tasty breakfast, try this smoothie out! Have a great weekend! 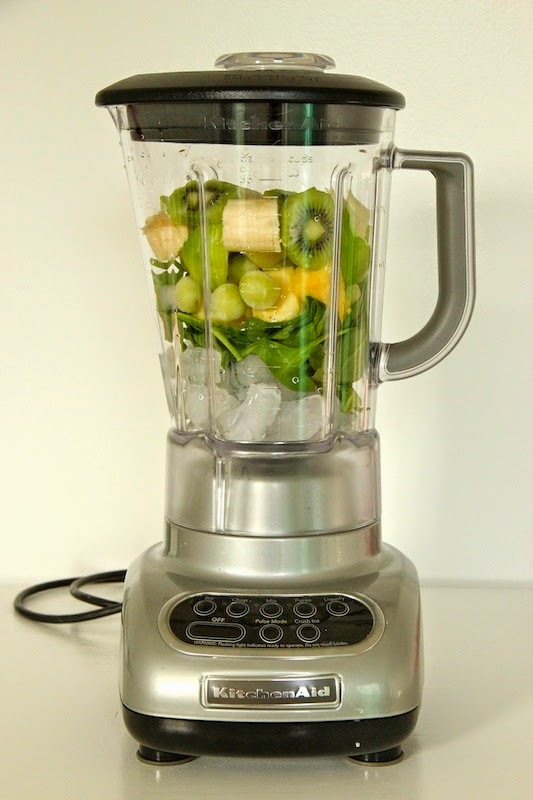 Place all ingredients in a blender. Blend until smooth. Makes 1 large serving or 2 small servings. i love playing around with my green smoothie - i'll try getting out some yogurt and putting in more ice with this one. thanks!